Choose your "co-stars," special date, and a romantic title to create this unique cinematic keepsake. 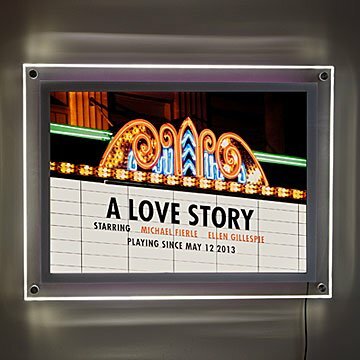 Celebrate your unique romance in cinematic style with this illuminated movie marquee art. Featuring the "co-stars" (your names) and a special date, you can include your own special title or pick one of three inspired by popular romantic films. Choose from full color, film noir-inspired black and white, or classic sepia. Backlit with soft LED lighting, it's a timeless, special way to commemorate a wedding or anniversary— aka the greatest love story of all time. Lightbox made in China. Art printed in Roseville, California. Click here to see the mounting instructions. Check out the Personalized Movie Marquee Photo Print™ here. Dampen a soft, lint free cloth with warm water or mild solution of dish detergent and water to remove dust and dirt from acrylic. Comes with plug in power cord and installation instructions. The printed art film is packaged separately to prevent damage in shipping.